Angela Meng, 4, of New Canaan, mixes the batter while David Fleming, 3, of Norwalk, waits his turn at the Cooking for Kids! class at the New Canaan Library, Friday, Nov. 9, 2018, in New Canaan, Conn.
NEW CANAAN — “I believe kids should be cooking more and appreciating food more,” said Renana Shvil, owner of Fiddleheads Cooking Studio of Mt. Kisco, N.Y.
That’s why Shvil was once again invited to lead the Cooking with Kids class for preschoolers at New Canaan Library on Friday morning. 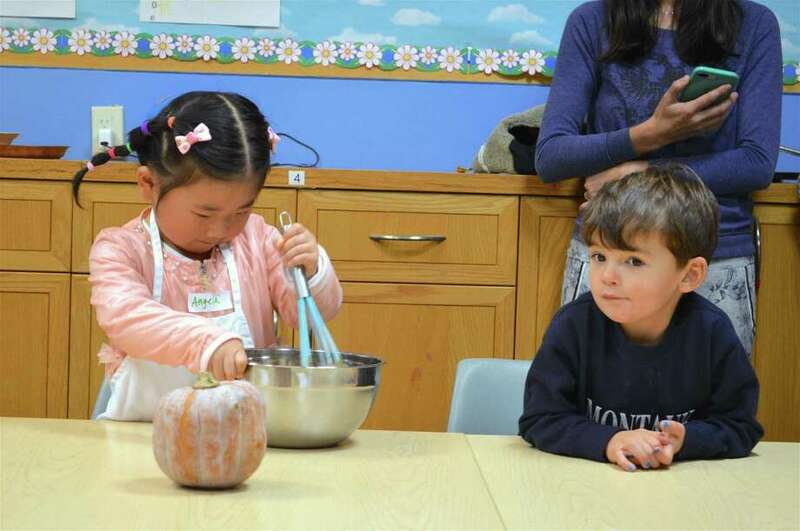 A dozen kids got a chance to help make pumpkin bread, learn about ingredients, measuring and mixing, and enjoyed a story reading before tasting the result of their work. “We’ve had her come multiple times and she’s always extremely popular,” said Cheryl Capitani, manager of family services.